Adapter molecules that promote protein-protein interactions play a central role in T lymphocyte differentiation and activation. In this study, we examined the role of the T lymphocyte-expressed adapter protein and Src kinase substrate, Sin, on thymocyte function using transgenic mice expressing an activated, truncated allele of Sin (SinΔC). We found that SinΔC expression led to reduced numbers of CD4+ and CD8+ single-positive cells and reduced thymic cellularity due to increased thymocyte apoptosis. Because the adapter properties of Sin are mediated by tyrosine-based motifs and given that Sin is a substrate for Src tyrosine kinases, we examined the involvement of these kinases in the inhibitory effects of SinΔC. We found that in transgenic thymocytes, SinΔC was constitutively phosphorylated by the Src kinase Fyn, but not by the related kinase Lck. Using SinΔC and fyn−/− animals, we also found that the expression of Fyn was required for the inhibitory effect of SinΔC on thymocyte apoptosis but not for SinΔC-mediated inhibition of T cell maturation. The inhibitory effect of SinΔC on thymocyte maturation correlated with defective activation of the mitogen-activated protein kinase extracellular signal-regulated kinase. Our results suggest that the Sin mutant inhibits thymocyte differentiation through Fyn-dependent and -independent mechanisms and that endogenous Sin may be an important regulator of thymocyte development. In recent years, adapter proteins have been shown to play important roles in the signaling mechanisms of a variety of cell types including T and B lymphocytes. Adapter proteins by definition lack enzymatic or transcriptional activity and control cellular behavior by mediating constitutive or inducible protein-protein or protein-lipid interactions through modular interaction domains (1, 2, 3, 4, 5, 6). T lymphocytes express a variety of adapter molecules that act as positive or negative regulators of TCR-dependent signaling. Positive regulators include linker for activation of T cells, Src homology 2 domain-containing leukocyte protein of 76 kDa (SLP76),3 and Grb2-related adapter downstream of Shc whereas negative regulators include Casitas B cell lymphoma (Cbl), SLP76-associated protein, protein associated with glycosphingolipid-enriched microdomains/CSK-binding protein (2, 3, 4, 5, 6, 7). The important roles of these adapters in T lymphocyte function have been substantiated with gene targeting experiments showing that SLP76, Grb2-related adapter downstream of Shc, and linker for activation of T cells are absolutely required for normal thymocyte development (8, 9, 10). In contrast, mice deficient for negative regulators of TCR signaling such as c-Cbl, Cbl-b, and Src-like adapter protein exhibit opposite phenotypes. These phenotypes include increased positive selection, increased expression of the surface molecules CD3, CD4, and CD5, markedly up-regulated activity of ζ-associated protein of 70 kDa, and extracellular signal-regulated kinase (ERK) (11, 12, 13), as well as spontaneous autoimmunity due to reduced T cell activation thresholds (14, 15). Our previous studies have concentrated on addressing the role of the novel adapter molecule Sin in the signaling pathways of Src family nonreceptor tyrosine kinases (16). Sin/Efs1 was cloned as a high affinity ligand for the Src- and Fyn-Src homology (SH)3 domains (16, 17) and belongs to a family of proteins, the other members being p130Cas and human enhancer of yeast filamentation 1/Crk-associated substrate in lymphocytes (18), (19, 20, 21, 22). The adapter properties of Sin and the other family members are due to conserved sequence motifs that mediate protein-protein interactions. These conserved motifs consist of: 1) proline-rich sequences that bind to SH3 domains such as those found on Src kinases (19, 23); 2) conserved tyrosine residues which, when phosphorylated by Src and other kinases, mediate interactions with SH2-domain-containing substrates (24); and 3) an SH3 domain that is highly conserved among the three family members (19). Given that Sin was isolated as a protein that binds to Src-kinase SH3 domains, we previously examined its functional properties in relation to Src kinases. The enzymatic activity of Src kinases is regulated intramolecularly through interactions of the conserved Src SH3 and SH2 domains with specific sequences within the Src kinase molecules (25, 26, 27, 28). Mutations that disrupt these interactions lead to constitutively active Src proteins and cellular transformation. In our experiments, instead of Src-constitutively active mutants, we used Sin as a high affinity ligand for the Src-SH3 domain, to out-compete the inhibitory intramolecular interactions of Src and activate the enzyme (16). We found that whereas full-length Sin only moderately induced Src enzymatic activity and signaling, a C-terminal deletion mutant of Sin, SinΔC, was a potent activator of Src kinase activity and signaling (29). The physiologic function of Sin is currently not known. In this report, we examined the role of Sin in T lymphocyte function because the thymus is one of the tissues in which endogenous Sin is most highly expressed. In addition, Sin is a Src kinase substrate and two Src kinases, Fyn and Lck, are known to play important roles in T lymphocyte physiology (30, 31, 32). Given that Sin-mediated protein-protein interactions are facilitated by Src kinase-phosphorylated tyrosine motifs (29, 33), we thought it was important to address the function of Sin in relation to these kinases. In previous experiments we found that the truncated form of Sin, SinΔC, was a better activator of and was more efficiently phosphorylated by Src kinases than the full-length Sin (29). Therefore, we used this protein for our studies. We found that specific expression of SinΔC in thymocytes of transgenic animals inhibited thymocyte development and survival, shown by reduced percentages of mature CD4+ and CD8+ single-positive (SP) T cells and increased thymocyte apoptosis. We also found that Sin was a substrate for Fyn but not Lck, and that Fyn was required for Sin-mediated thymocyte apoptosis but not for the block in thymocyte maturation. Moreover, SinΔC expression correlated with reduced ERK activation, which is required for proper selection of thymocytes. 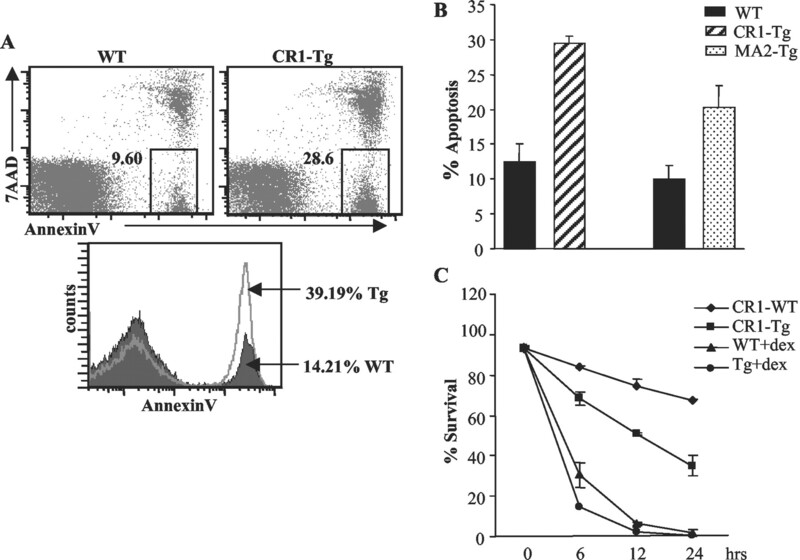 These experiments are the first to address the role of Sin in T lymphocyte function in vivo and suggest that truncated Sin is a negative regulator of T lymphocytes through Fyn-dependent and -independent mechanisms and that endogenous Sin may be an important regulator of T lymphocyte function. A cDNA fragment encoding aa 1–335 of full-length Sin was cloned into the EcoRI/SmaI site of the CD2 expression cassette containing the human CD2 minigene previously described to express the transgene both in immature thymocytes and in mature T cells (34). An 11.2-kb KpnI/NotI fragment containing the transgene was microinjected into (C57BL/6 × CBA/J)F1 fertilized eggs derived from hyperovulated donor females. Transgenic founders were identified by PCR and Southern blot analysis of tail DNA and transgenic lines were established by backcrossing to C57BL/6 mice. C57BL/6 and fyn−/− animals were purchased from The Jackson Laboratory (Bar Harbor, ME). Mouse mAbs: anti-Sin-specific Ab was obtained from BD Transduction Laboratories (Lexington, KY); anti-Fyn, anti-Lck, and anti-phospho-ERK were obtained from Santa Cruz Biotechnology (Santa Cruz, CA); anti-phosphotyrosine-specific Ab was obtained from Upstate Biotechnology (Lake Placid, NY). Rabbit polyclonal anti-jun N-terminal kinase (JNK), and phospho-JNK were obtained from New England Biolabs (Beverly, MA) and anti-ERK goat polyclonal was obtained from Santa Cruz Biotechnology. Dexamethasone and enolase were purchased from Sigma-Aldrich (St. Louis, MO). Freshly isolated thymocytes (1 × 106) from 6- to 8-wk-old mice were incubated with the appropriate Abs in staining medium (3% FCS, 0.1% sodium azide in PBS) for 15 min on ice. Cells were spun down and washed three times with staining medium and analyzed by flow cytometry using a FACSCalibur and CellQuest software. Anti-CD4-allophycocyanin, CD8-PerCP, CD3-FITC, CD69-FITC, CD5-FITC, TCR-β-FITC-conjugated Abs were purchased from BD PharMingen (San Diego, CA). Purified mouse monoclonal anti-CD3 Ab used for cross-linking was obtained from BD PharMingen. For analyzing spontaneous thymocyte apoptosis in vitro, 5 × 105 thymocytes from SinΔC transgenic and negative littermate controls were cultured in tissue culture medium for different time points. Dexamethasone (10 μM) was added in parallel cultures as a control for apoptosis. Thymocyte apoptosis was assayed by Annexin VPE and 7-amino actinomycin D (7AAD) staining, using an apoptosis detection kit (BD PharMingen) according to the manufacturer’s protocol and a FACSCalibur with CellQuest software. Cell debris was gated out on the basis of forward and side scatter analysis. Percent apoptosis is expressed as the amount of cells staining positive for annexin V and negative for 7AAD (early stage) and survival is represented as percent of cells that were annexin V- and 7AAD-negative. Thymocytes (1 × 107) were incubated with 2 μg of anti-CD3 Ab on ice for 15 min, washed with cold PBS, and supercross-linked with 5 μg of goat-anti-mouse IgG for 20 min on ice. Cells were then incubated at 37°C for different points, spun down, and immediately lysed. Cell lysates were used for immunoblot analysis. Thymocytes (0.5–1 × 107) were cross-linked with anti-CD3 for different time points. Total cell lysates were subjected to SDS-PAGE, transferred to nitrocellulose membranes, and probed with anti-phospho-ERK or anti-phospho-JNK to reveal the phosphorylated forms of these kinases. Blots were stripped and reprobed with anti-ERK and anti-JNK Abs to determine the amounts of total ERK and JNK. Immunoprecipitations were performed as previously described (16). Briefly, cells were lysed in 1 ml of ice-cold Nonidet P-40 lysis buffer (1% Nonidet P-40, 20 mM Tris-HCl (pH 8.0), 150 mM NaCl, 10% glycerol, 10 mM NaF, 1 mM sodium orthovanadate, 1 mM PMSF, 10 μg/ml aprotinin, 10 μg/ml leupeptin) and incubated on ice for 30 min. The cell debris and nuclei were removed by centrifugation for 10 min at 4°C. The cell lysates were then incubated with the specified Abs at concentrations suggested by the manufacturers for 2 h at 4°C. The immune complexes were collected after the addition of 20 μl of protein G- plus protein A-agarose (Oncogene Research Products, San Diego, CA) and incubation at 4°C for 30 min. The pellets of agarose beads were washed three times with 1 ml of lysis buffer and then subjected to SDS-PAGE and immunoblotting. Protein complexes obtained by immunoprecipitation were washed three times in kinase buffer and reactions were conducted in 20 μl of kinase buffer containing 20 mM HEPES, pH 7.4, 5 mM MnCl, 10 μM ATP, and 1 μl of [γ-32P]ATP (5000 Ci/mmol) at room temperature for 5 min. When required, 5 μg of the exogenous substrate enolase was added to the samples as shown and as previously described (35). The pellets were resuspended in 1× Laemmli buffer, boiled for 5 min, and phosphorylated proteins were analyzed by SDS-PAGE and autoradiography. Total cell extracts or immunoprecipitates normalized for protein content were boiled in Laemmli sample buffer, electrophoretically separated on 10% SDS-PAGE, and transferred to nitrocellulose membranes. Filters were blotted with the appropriate monoclonal antisera according to manufacturer’s protocol in TBST/milk at 4°C overnight (16 h). Rabbit polyclonal Abs were used at a 1/500 dilution. mAbs were used at 1 μg/ml TBST/milk each. The filters were washed in TBST and consequently incubated with anti-mouse or anti-rabbit IgG-conjugated HRP at a 1/4000 dilution in TBST at room temperature for 1 h. Filters were then washed and developed with ECL (Amersham, Piscataway, NJ), as described by the manufacturer. On Northern blots endogenous Sin is most highly expressed in the adult thymus and brain, while Sin can be detected in multiple tissues by RT-PCR (36). 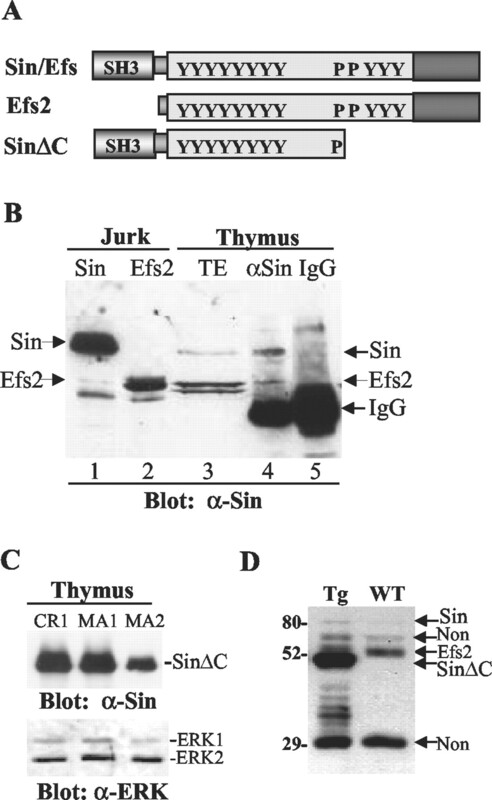 At least two Sin isoforms can be detected in thymocyte and T cell extracts on Western blots of total lysates and Sin immunoprecipitates; full-length Sin and the previously described Efs2 (36), a Sin alternative splice form in which the SH3 domain is deleted (Fig. 1⇓, A, B, and D) (36). Two different Sin isoforms are expressed in the thymus. A, Schematic representation of Sin isoforms and SinΔC. Full-length Sin consists of a SH3 domain, a central region containing eleven tyrosine residues, and two proline-rich motifs (RPLPALP and RPLPPPP) that have high binding affinity and specificity for Src kinase SH3 domains. Efs2 is a naturally occurring isoform that is missing 93 aa consisting of the entire SH3 domain and additional residues before the central substrate-binding region of the protein. SinΔC is missing an ∼200 aa fragment, which contains the second proline-rich motif (RPLPPPP), three tyrosine residues, and a conserved region of ∼140 aa at the extreme C terminus. Y represents tyrosine-containing sequences (Y motifs), P represents proline-rich motifs. B, Western blots of thymocyte and Jurkat T cell extracts probed with a Sin-specific mAb to reveal expression of the Sin isoforms. Lanes 1 and 2 represent total cell lysates from Jurkat cells overexpressing full-length Sin and Efs2 as controls. TE represents total thymocyte extract (lane 3) probed with anti-Sin-specific Ab. In lanes 4 and 5, cell extracts from 107 thymocytes were immunoprecipitated with anti-Sin or isotype-matched control IgG, proteins were separated on SDS-PAGE and Western blotted with Sin-specific Ab. C, Thymocyte cell extracts from three different founders expressing SinΔC were separated on SDS-PAGE and Western blotted with anti-Sin Ab. The blot was stripped and reprobed with ERK-specific Ab as a loading control. D, Endogenous Sin expression was compared with expression of SinΔC from CR1 mice on Western blots of thymocyte total cell extracts probed with Sin-specific Ab. Two nonspecific bands (Non) are recognized by the Sin Ab on Western blots. The lower nonspecific band was included as a control for equal loading. To explore the function of Sin in T lymphocytes, we generated transgenic mice expressing the truncated form of Sin, SinΔC (Fig. 1⇑A). The truncation removes a C-terminal portion of Sin and exposes one of the proline-rich motifs of Sin that binds to Src kinase SH3 domains with high affinity. We have previously shown that the C terminus of Sin inhibits the ability of Sin to mediate Src signaling. Deletion of this region results in a protein that is a better activator and transducer of Src kinase signaling than the full-length Sin protein (29). In the experiments described in this study we used this activated mutant because efficient Src kinase-mediated phosphorylation of tyrosine residues within Sin is required for Sin adapter function (29). SinΔC expression in the transgenic animals is regulated by the human CD2 promoter, which allows transgene expression in both thymocytes and mature T cells (34). Transgenic progeny from three founder mice were identified by PCR and Southern blot analysis and expression of the transgene was confirmed in thymocyte extracts using a Sin-specific Ab (Fig. 1⇑C). Two transgenic lines CR1 and MA2 with 22 and 13 integrated copies of the transgene, respectively, were chosen for further studies. Expression of the transgene in CR1 mice was compared with the endogenous full-length Sin and Efs2 proteins on Western blots of total thymocyte lysates probed with Sin-specific Ab as shown (Fig. 1⇑D). Expression of Efs2 is more pronounced than full-length Sin and in transgenic lysates Efs2 migrates slightly above SinΔC. The physiologic significance for the presence of two different isoforms is currently not clear and is under investigation. Thymocyte development is a series of complex developmental events that culminates in the production of mature T cells from immature precursors. The different stages of thymocyte development are characterized by the sequential expression of surface markers such as CD44 and CD25, the pre-TCR, and the CD4 and CD8 coreceptors. CD4−CD8− double-negative (DN) cells undergo rearrangement of the TCRβ and successful rearrangement together with pre-TCR engagement allows their progression to the CD4+CD8+ double-positive (DP) stage (37, 38, 39, 40, 41). CD4+CD8+ DP cells that have successfully rearranged their TCRα locus subsequently undergo positive or negative selection. Positively selected thymocytes down-regulate expression of either their CD4 or CD8 coreceptors to become mature CD4+ or CD8+ SP mature T cells (41, 42). Initial analysis of transgenic animals revealed that the thymi of the SinΔC-expressing animals were smaller in size than the wild-type controls. Analysis of multiple animals showed that, consistent with the smaller thymus, the total transgenic thymocyte numbers recovered were ∼40% of wild-type levels (Fig. 2⇓A). The decrease in total number of thymocytes was due to significant decreases in the number of cells in the DP, CD4, and CD8 SP populations, and an observed, however, not significant reduction in the DN population, (Fig. 2⇓B). Expression of SinΔC in the thymus interferes with normal thymocyte maturation. A, Total thymocytes from 6- to 8-wk-old wild-type and transgenic animals were counted and averaged as shown. At least five animals from two different transgenic lines were used. B, Cells within each thymic subset were enumerated by FACS analysis. Results from at least 10 wild-type and 18 CR1 mice are represented as the mean ± SD. Similar results were obtained with the MA2 transgenic animals (data not shown). C, Thymocytes from 6- to 8-wk-old mice were stained with CD4-allophycocyanin and CD8-PerCP mAbs (1 × 106 cells/well) and analyzed by flow cytometry. Shown are CD4 vs CD8 plots of normal littermate controls and two transgenic lines CR1 and MA2 as shown. WT1 is litter-mate control for CR1 and WT2 for MA2. The numbers represent the percentage of thymocytes in the boxed areas. The bottom graphs represent percentages of cells within each population as shown, expressed in relation to total thymocyte numbers (mean ± SD). D, The histograms represent profiles of total thymocytes from wild type and transgenic animals stained with CD3 or CD69 Abs as shown. E, Histograms of DP, CD4+ and CD8+ cells stained with CD4/CD8 Abs and FITC-conjugated Ab specific for different surface markers as shown. Wild-type cell populations are represented by the gray line, transgenic cells by the filled curve. To further examine the effect of SinΔC expression on thymocyte development, thymocytes from wild-type and transgenic littermates were stained with fluorescently labeled mAbs against different surface molecules such as CD4, CD8, CD3ε, and CD69. A representative flow cytometric analysis of thymocytes from two founder lines, CR1 and MA2, is shown in Fig. 2⇑C. In addition, the percentage of cells within different thymocyte populations in relation to total thymocytes is shown at the bottom of Fig. 2⇑C. When equal numbers of thymocytes were stained, we found that the percentage of cells that were negative for CD4/CD8 expression (DN), as well as cells bearing both CD4 and CD8 coreceptors (DP thymocytes), were unaffected in the transgenic animals (Fig. 2⇑C). 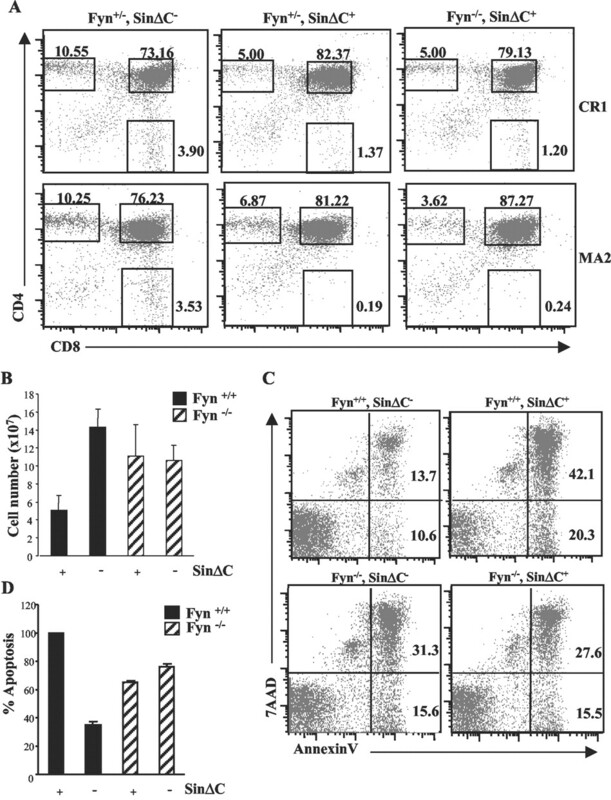 However, the same phenotypic analysis of these thymocytes revealed a substantial decrease in the percentages of mature CD4+8− and CD4−8+ SP cells (Fig. 2⇑C). The CD8+ population in particular was most severely affected as the proportion of these cells was decreased by ∼70–90% as compared with normal controls (Fig. 2⇑C). The effect of transgene expression on the percentage of CD4+ SP cells was a reduction by ∼50–60% (Fig. 2⇑C). Taken together, these data suggest that SinΔC expression compromises the viability, but not the development of, DP thymocytes while specifically perturbing the maturation of SP cells. To further characterize the maturation of thymocytes, we analyzed the expression of several thymocyte cell surface markers. The first, CD3ε, is a component of the TCR whose expression is up-regulated as thymocytes mature from the DP to the SP stage (43). The total CD3high mature T cell population normally represents ∼15% of total thymocytes. Staining of SinΔC transgenic thymocytes revealed a 2- to 3-fold decrease in the total CD3high population (Fig. 2⇑D, CD3, top histograms). Additionally, for total thymocytes we observed reduced expression levels of CD69 (Fig. 2⇑D, bottom histograms), a maturation marker whose expression correlates with positively selected, maturing thymocytes (44). Decreased expression of the CD3 and CD69 markers in the total thymocyte population could be explained by the decrease in SP cell populations (Fig. 2⇑B) or by abnormally low levels of expression in the SP population. To decipher between these two possibilities, we further examined the role of SinΔC expression on thymocyte development by analyzing the levels of several cell surface markers on the individual DP and CD4+ and CD8+ SP cell populations. In addition to CD3ε and CD69, we also analyzed the expression levels of the β component of the TCR and CD5. CD5 is another maturation marker whose levels rise steadily during thymocyte maturation and is dependent on TCR signaling (45). Thus, thymocytes were triple-stained with CD4/CD8 and CD3ε, TCRαβ, CD5, or CD69 mAbs. The different thymocyte populations from wild-type and transgenic animals were defined on the basis of CD4/CD8 fluorescence intensity, and fluorescence histograms depicting CD3, CD5, CD69, or TCRβ expression on DP and SP cells are shown (Fig. 2⇑E). The expression patterns for the different markers in all subpopulations were similar to the wild type, while the absolute numbers of cells in the CD4+ and CD8+ compartments were less in the transgenic animals (Fig. 2⇑E). Thus, the reduction in CD3 and CD69 expression in the entire thymocyte population is solely due to the reduction of the CD4+ and CD8+ SP population, rather than lower levels of CD3/CD69 expression. Consistent with this, we also found that the decrease in T lymphocyte numbers was not confined to the thymus because the numbers of mature splenic T cells of both the CD4 and CD8 lineages were substantially reduced (∼50%) in transgenic animals as compared with normal littermate controls (data not shown). In addition, staining of splenocytes with B cell-specific Abs (B220, IgM) revealed that the B cell compartment was intact, consistent with CD2-promoter-mediated, T cell-specific expression of SinΔC (data not shown). In summary, our results show that expression of SinΔC in thymocytes inhibits production of normal numbers of mature T cells and suggest that the truncated Sin mutant is a negative regulator of T lymphocyte differentiation. As shown above in Fig. 2⇑A, the total transgenic thymocyte numbers recovered were ∼40% of wild-type levels. DP thymocytes constitute the bulk of the thymus and we found that the actual cell numbers of transgenic DP thymocytes were reduced by 50% (Fig. 2⇑B). However, the percentage of transgenic DP thymocytes recovered were similar to wild-type controls, suggesting that SinΔC expression affects the survival, but not the development, of these thymocytes. Thus, we examined whether the inhibitory effect of SinΔC was caused by enhanced levels of thymocyte apoptosis. Freshly prepared thymocytes from wild-type and CR1 transgenic animals were cultured in medium for 6 h before staining with the vital dye 7AAD and annexin V. Typical results from two-parameter analyses are shown in Fig. 3⇓A (dot plots). Indeed, we observed a higher percentage of annexin V-positive cells from transgenic animals (28.59%) as compared with wild type (9.60%), thus revealing that there is enhanced spontaneous apoptosis in the transgenic thymocytes (Fig. 3⇓A). This increase was consistent in cells undergoing early apoptosis (7AAD−/annexin V+) as well as in thymocytes at a later stage of cell death (7AAD+/annexin V+) (Fig. 3⇓A, right and bottom panels). Results from several experiments using two different founder lines (CR1 and MA2) show a >2-fold increase in spontaneous thymocyte apoptosis in transgenic mice as compared with normal controls (Fig. 3⇓B). We also found a concurrent decrease in transgenic thymocyte survival as determined by decreased numbers of live 7AAD−/annexin V− cells over a 24-h period (Fig. 3⇓C). Dexamethasone treatment of wild-type and transgenic cells was included in these experiments as a control for thymocyte apoptosis (Fig. 3⇓C). These results suggest that expression of SinΔC reduces thymic cellularity by increasing thymocyte apoptosis, thus negatively regulating thymocyte survival. SinΔC expression increases thymocyte apoptosis. A, Total thymocytes from CR1 animals were cultured for 6 h and then stained with Annexin VPE and 7AAD. Representative dot plots of a two-parameter FACS analysis are presented for wild-type and transgenic thymocytes. Boxed areas represent the percentages of cells undergoing early apoptosis (annexin V+, 7AAD−). A histogram of total annexin V staining is shown at the bottom along with percentages of wild-type and transgenic cells undergoing cell death. B, Wild-type and transgenic thymocytes from CR1 and MA2 mice were harvested, cultured for 6 h, and then stained with 7AAD and annexin V. Percent apoptosis is represented as the number of cells that are annexin V+/7AAD− (early apoptosis) averaged from three different experiments expressed as mean ± SD, for two transgenic founders as shown. C, Thymocytes from wild-type and transgenic CR1 mice were cultured with or without dexamethasone for the indicated times and then stained with 7AAD and annexin V. Percent survival is represented as the number of live cells (7AAD and annexin V-negative) remaining at each time interval. Sin and similar adapter molecules exhibit no known enzymatic activity and modulate signaling through the formation of protein-protein interactions mediated by proline-rich and tyrosine-based motifs (29). Phosphorylation of the tyrosine-based motifs by tyrosine kinases is essential for binding of these residues to their ligands, which are SH2-domain-containing signaling intermediates (19, 33). In previous experiments, we found that the truncated form of Sin, used in this study as the transgene, can very efficiently bind to the Fyn- and Src-SH3 domains through its proline-containing motif, activate Src kinase signaling, and become constitutively phosphorylated on tyrosine residues (23, 29). We speculated that expression of the truncated mutant in thymocytes should then lead to Src kinase-mediated constitutive SinΔC phosphorylation and signaling. Given that Sin was cloned as a Src kinase ligand and Fyn and Lck are the most prevalent Src kinases in thymocytes, we tested whether Fyn and/or Lck could interact with SinΔC in transgenic thymocytes. Thymocyte cell extracts from wild-type and transgenic animals were immunoprecipitated with Fyn- and Lck-specific Abs, and the immune complexes were incubated in the presence of radioactive ATP. We found that the SinΔC protein associated with and was phosphorylated by Fyn in vitro (Fig. 4⇓A, left panels). In addition, we found that Fyn associated with phosphorylated Sin in anti-Sin immunoprecipitates (Fig. 4⇓A, right panels). This was expected, given the specificity of the proline-rich motif of SinΔC for the Src and Fyn SH3 domains (23) which is a prerequisite for stable association of Sin with these kinases (16). In addition to SinΔC, we also tested the phosphorylation of the exogenous substrate, enolase, which has traditionally been used to assay for increased Src kinase activity (35). As with SinΔC, enolase was also phosphorylated in transgenic, but not wild-type, cell extracts, consistent with the proposed SinΔC-induced activation of Fyn (Fig. 4⇓B). In contrast to Fyn, we did not observe SinΔC binding to Lck (Fig. 4⇓A, middle panels). This observation is not surprising given that the proline-rich motifs of Sin do not recognize the Lck-SH3 domain (16). This is due to the fact that the Lck SH3 domain is the most divergent within the Src family, recognizing a different consensus sequence than the Fyn and Src SH3 domains which is not present on Sin (23, 46, 47). Thus, these results show that SinΔC preferentially binds to Fyn in thymocytes and suggest that Fyn-dependent phosphorylation of SinΔC may be important for the inhibitory effects of SinΔC in thymocyte development. SinΔC interacts with the Src kinase Fyn in thymocytes. Thymocyte cell extracts from wild-type and SinΔC transgenic mice were immunoprecipitated with Fyn-, Lck- and Sin-specific Abs, and immune complexes were incubated in vitro with [γ32-P]ATP for 10 min. Proteins were separated by electrophoresis and blotted onto nitrocellulose membrane. The membrane was exposed on film for 24 h at −70°C (top panels). Then the same membrane was first incubated with Sin-specific Ab (middle panels), and then were stripped and reprobed with either Fyn- or Lck-specific Abs as shown (bottom panels). Protein bands were visualized by ECL. In the middle panel, the bands from the Lck immunoprecipitation probed with the Sin Ab are nonspecific bands. B, Thymocyte cell extracts were immunoprecipitated and kinase assays performed as in A, except that 5 μg of purified enolase were exogenously added to each tube. The membrane was stripped and reprobed with Fyn-specific Ab. C, SinΔC-expressing thymocytes from wild-type or fyn−/− animals were immunoprecipitated with anti-Sin Ab and Western blotted first with antiphosphotyrosine and then with Sin-specific Abs. Protein bands were visualized by ECL. 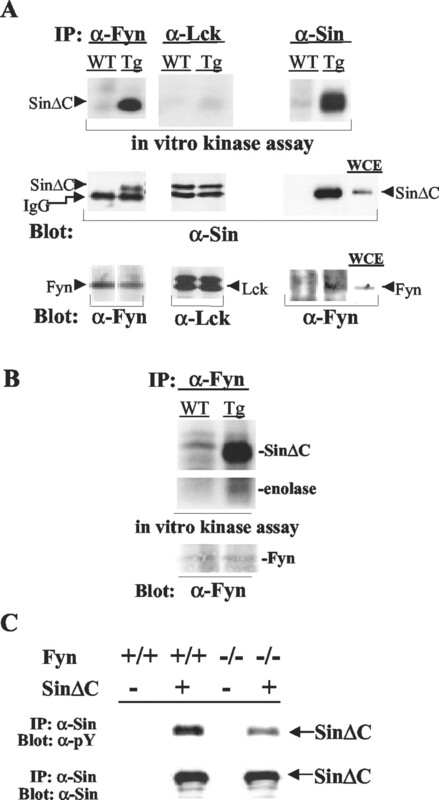 Given that SinΔC preferentially binds to and is phosphorylated by Fyn in thymocytes (Fig. 4⇑A), we speculated that Fyn-mediated phosphorylation of SinΔC in the thymus may regulate the inhibitory effects of SinΔC on thymocyte survival and maturation. To test the role of Fyn in SinΔC-mediated inhibition of thymocyte maturation and survival, we crossed the SinΔC-expressing mice to fyn−/− animals (31, 32). Thymocytes from normal and SinΔC-expressing animals in a fyn+/− or fyn−/− background were stained with CD4/CD8 and analyzed by flow cytometry. We found that in the absence of Fyn, SinΔC still blocked thymocyte maturation, again shown by reduced percentages of CD4+, and especially CD8+, SP cells (Fig. 5⇓A). Thus, these data suggest that Fyn is not required for the inhibitory effect of SinΔC in thymocyte differentiation. Fyn−/−/SinΔC− thymocytes were also analyzed and found to be similar to Fyn+/−/SinΔC− thymocytes (not shown), consistent with data obtained with fyn−/− animals showing that the absence of Fyn has no effect on thymocyte development (31, 32). In addition, we found that although SinΔC is a substrate of, and is phosphorylated by Fyn in vitro (Fig. 4⇑A), immunoprecipitation of SinΔC from fyn−/−/SinΔC+ thymocytes shows reduced but significant residual SinΔC phosphorylation (Fig. 4⇑C). These results suggest that in addition to Fyn, other kinases phosphorylate SinΔC and may regulate the effects of this protein on thymocyte maturation. Fyn is dispensable for the inhibitory effect of SinΔC on thymocyte maturation but is required for SinΔC-mediated thymocyte apoptosis. A, Thymocytes from 6- to 8-wk-old mice were stained with anti-CD4 and anti-CD8 Abs and analyzed by flow cytometry as in Fig. 2⇑. Shown are CD4 vs CD8 plots of normal or transgenic mice from two transgenic lines (CR1, MA2) in heterozygous or null fyn background as shown. The numbers represent the percentages of thymocytes in the boxed areas. A representative analysis of four experiments is shown. B, Freshly isolated thymocytes were counted and total cell numbers were plotted as shown expressed as mean ± SD (n = 5). C, Cells from wild-type or fyn−/− animals in the presence or absence of SinΔC were also incubated at 37°C for 6 h, stained with annexin V and 7AAD and analyzed by flow cytometry. D, Percent apoptosis is represented as the percentage of cells that are annexin V+/7AAD− (early apoptosis) from different samples, normalized to percent apoptosis obtained from staining Fyn+/+/SinΔC+ thymocytes which was given an arbitrary value of 100. Subsequently, we examined whether the effect of SinΔC-mediated reduction in total thymocyte numbers required Fyn. Consistent with the results shown above (Fig. 2⇑A) we found a substantial reduction in total thymocyte numbers in cells expressing SinΔC in a wild-type Fyn background as compared with normal thymocytes (Fig. 5⇑B). However, in the absence of Fyn, SinΔC expression had no effect on thymocyte numbers, suggesting that Fyn is required for the decrease in thymic cellularity observed in SinΔC transgenic animals (Fig. 5⇑B). To further address the role of Fyn in SinΔC-mediated thymic atrophy, we examined thymocyte apoptosis in a SinΔC/fyn−/− background. To this end, thymocytes from wild-type and transgenic animals in a wild-type or null fyn background were analyzed as in Fig. 3⇑. Annexin V and 7AAD staining revealed that SinΔC expression led to increased spontaneous thymocyte apoptosis (Fig. 5⇑C) consistent with the results presented in Fig. 3⇑. In contrast, although we observed higher levels of apoptosis in fyn−/− thymocytes, no further effect was observed in the presence of SinΔC (Fig. 5⇑, C and D), again suggesting that Fyn is required for the effects of SinΔC on thymocyte apoptosis. Similar results were obtained with thymocytes from MA2 transgenic animals (not shown). Given that Fyn regulates phosphorylation events proximal to the TCR after receptor cross-linking (31, 32), we examined whether SinΔC expression had an effect on total protein tyrosine phosphorylation induced in response to TCR cross-linking. Thymocytes from wild type and SinΔC animals were stimulated for the indicated times by TCR cross-linking using anti-CD3ε-specific Ab and Western blots of total cell lysates were immunoblotted with antiphosphotyrosine-specific Ab. We found no discernible differences in the pattern of tyrosine phosphorylated proteins between wild type and transgenic lysates with the notable exception of SinΔC, which is prominently and constitutively phosphorylated in transgenic cell lysates (Fig. 6⇓A). This observation was consistent with previous experiments (29) and our rationale that the truncated mutant would efficiently interact with Src kinases and be effectively phosphorylated. Thus, our results suggest that SinΔC expression has no effect on Lck/Fyn-mediated phosphorylation events proximal to the TCR and that SinΔC may exert its inhibitory effects downstream of the receptor and the signal-initiating phosphorylation events. These results also suggest that SinΔC is not acting as a competitive inhibitor for Fyn/Lck-mediated substrate phosphorylation due to overexpression. Normal total tyrosine phosphorylation but reduced ERK activation in SinΔC-expressing thymocytes. Thymocytes were cross-linked with anti-CD3 Ab for the indicated times at 37°C. Western blots of total cell extracts were incubated with the following Abs: anti-phosphotyrosine (A), anti-phospho-ERK and anti-phospho-JNK (B and C, top panels), stripped and reprobed with anti-ERK or anti-JNK as shown (B and C, bottom panels). Protein bands were visualized using ECL. Given the lack of an effect of SinΔC expression on tyrosine phosphorylation events proximal to the TCR, we examined the effect of SinΔC on downstream signaling events such as phosphorylation of the MAPKs ERK and JNK. Activation of these kinases in thymocytes is the result of TCR-mediated activation of the Ras signaling cascade (48, 49). Total thymocytes from normal or SinΔC mice were incubated with anti CD3ε Ab for different times at 37°C. Total cell extracts were fractionated and blotted with anti-phospho-ERK or JNK Abs which recognize the phosphorylated, active forms of ERK1,2 and JNK. In normal thymocyte cell extracts, phosphorylation of ERK1,2 was rapidly stimulated in response to TCR cross-linking, and was sustained for at least 10 min (Fig. 6⇑B, top panel). In contrast, ERK1,2 phosphorylation in thymocyte cell extracts from SinΔC mice was less pronounced and was rapidly down-regulated (Fig. 6⇑B, top panel). In contrast, JNK phosphorylation was intact in transgenic lysates immunoblotted with phospho-JNK-specific Ab (Fig. 6⇑C, top panel). 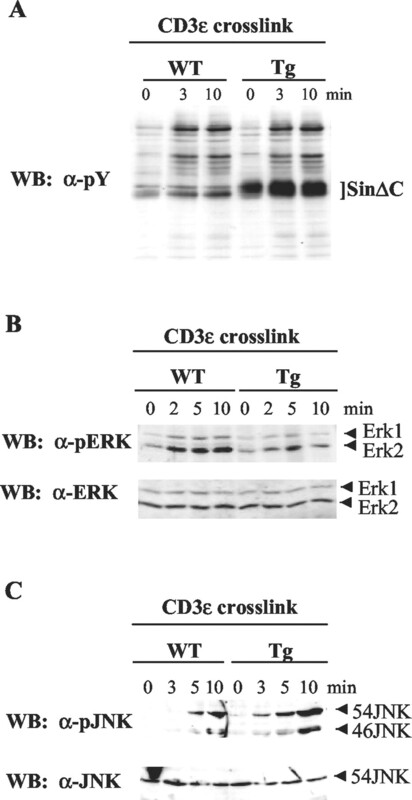 The levels of total ERK1,2 and JNK proteins, revealed by immunoblotting with specific Abs against total ERK and JNK, were similar in all cases (Fig. 6⇑, B and C, bottom panels). These data show that the levels as well as the kinetics of ERK1,2 stimulation in SinΔC thymocytes are inhibited as compared with normal controls and suggest that SinΔC may inhibit thymocyte function by interfering with normal ERK activation. In this report, we examined the role of the novel adapter molecule Sin in T lymphocyte function. We used this system for our studies because the thymus is one of the tissues in which Sin is most highly expressed. In addition, two Src kinases, Lck and Fyn, potentially involved in Sin phosphorylation, are also expressed in the thymus and are important for T lymphocyte function. In previous studies, we showed that full-length Sin is less potent in its ability to mediate Src kinase signaling as compared with a truncated form, SinΔC. Therefore, in the present study we expressed SinΔC in the thymocytes of transgenic animals with the assumption that truncated Sin would act as an activated mutant that would more efficiently interact with and become phosphorylated by endogenous Src kinases. Efficient phosphorylation of Sin by Src and possibly other kinases is essential for the adapter function of Sin. Consistent with this, SinΔC was constitutively phosphorylated by Fyn in transgenic thymocytes. We found that expression of SinΔC inhibited thymocyte maturation, shown by reduced percentages of CD4+ and particularly CD8+ cells, and induced thymocyte apoptosis. We also found that Fyn was required for the effect of SinΔC on thymocyte apoptosis but not for inhibition of thymocyte transition to SP cells. In the same experiments, SinΔC failed to associate with and become phosphorylated by Lck. The observation that Fyn is not required for the negative effects of SinΔC on mature T cell production is not surprising given that fyn−/− animals exhibit normal T cell maturation (31, 32). Therefore, SinΔC may be exerting this inhibitory effect through association with other kinases and/or intracellular signaling molecules. Consistent with the involvement of kinase(s) other than Fyn or Lck is our observation that there is significant residual tyrosine phosphorylation of SinΔC in fyn−/− thymocytes. Although the identity of this kinase(s) is currently unknown, efforts are under way to identify additional proteins that may phosphorylate SinΔC on tyrosine residues. Alternatively, other conserved domains mediating protein-protein interactions such as proline-rich motifs may be mediating the effects of Sin. Although Fyn is not required for SinΔC-mediated inhibition of thymocyte maturation, Fyn is necessary for the effects of SinΔC on thymic cellularity and thymocyte apoptosis. Indeed, we found that in the absence of Fyn, SinΔC had no effect on thymocyte numbers and thymocyte apoptosis (Fig. 5⇑, B and C). We also observed a consistent reduction of total thymocyte numbers in fyn−/− animals and increased apoptosis as compared with wild-type cells (Fig. 5⇑, B and C). This finding could be explained by existing evidence suggesting that Fyn contributes to the generation of DP thymocytes. In lck null animals, the production of mature SP T cells is severely impaired whereas DP thymocytes are being produced albeit at reduced levels (30). However, the presence of these DP cells is completely obliterated in the fyn−/−/lck−/− double null background, suggesting that Fyn can compensate for Lck in the production of DP cells (50, 51). This could explain the reduction in thymocyte numbers and increased apoptosis we observe with fyn−/−/SinΔC animals. We found that SinΔC expression causes no additional decrease on thymocyte numbers in the absence of Fyn, suggesting that SinΔC-induced apoptosis requires Fyn. Thus, the increase in thymocyte apoptosis in transgenic animals could be the result of either a novel inhibitory signal mediated by phosphorylated SinΔC or of dominant inhibition of Fyn function by overexpressed SinΔC. In our experiments, we found that SinΔC is prominently phosphorylated in unstimulated transgenic cells, and that there may be a small increase in its phosphorylation in response to TCR cross-linking (Fig. 6⇑A). More importantly, there are no apparent differences in the total protein tyrosine phosphorylation in the transgenic cells as compared with wild-type controls, in cell extracts from stimulated or unstimulated cells (Fig. 6⇑A), unlike the reduced phosphorylation of substrates observed in fyn null thymocytes (31). The lack of a positive or negative effect of SinΔC expression on tyrosine phosphorylation has two implications. First, data presented in Fig. 4⇑ suggest that expression of SinΔC in thymocytes leads to Fyn activation and SinΔC phosphorylation. If Fyn is indeed activated, we should observe increased substrate phosphorylation and a phenotype similar to that of mice overexpressing Fyn, i.e., hyperstimulatable thymocytes and increased substrate phosphorylation (52). This is opposite to our results with SinΔC-activated Fyn. We believe this is due to the fact that ligand-activated Src kinases behave differently than their constitutively active counterparts that are induced as a result of mutations or overexpression. Thus, in contrast to constitutively activated Src kinases, expression of SinΔC with Src kinase in a cell culture system does not lead to increased substrate phosphorylation and the signaling mechanism of SinΔC-activated Src is different from signaling through constitutively active Src (16, 29). Second, the lack of a negative effect of SinΔC expression on substrate phosphorylation argues against a dominant inhibitory effect for SinΔC on Fyn- and/or Lck-mediated phosphorylation due to SinΔC overexpression and supports the existence of a novel inhibitory signal(s) mediated by SinΔC. Consistent with this, we found that phosphorylation of the MAPK ERK was impaired in SinΔC-expressing cells as compared with normal controls. This effect was specific to ERK because phosphorylation of the related MAPK JNK was normal. These results suggest that SinΔC may be specifically inhibiting ERK activation through a mechanism downstream of the phosphorylation events proximal to the TCR. During thymocyte maturation, αβ T cells undergo positive or negative selection, events that are regulated by TCR ligation of self-peptide-MHC complexes on epithelial cells of the cortex. There is substantial evidence that ERK kinase is an important regulator of positive selection of thymocytes. Early experiments with dominant negative inhibitors of the Ras-MAP or ERK kinase pathway showed that ERK activation through the Ras signaling cascade is required for positive selection and thymocyte maturation whereas negative selection proceeds unimpaired (53, 54). More recent evidence has shown that ERK activation can regulate both selection processes in immature thymocytes (55, 56). The threshold model can explain these apparently conflicting results. This model suggests that the kinetics and extent of ERK activation in response to TCR ligation determine positive vs negative selection (57, 58, 59). Collectively, these data suggest that ERK activation is an important signaling event in thymocyte maturation. In our system, we found that ERK activation is impaired in thymocytes expressing SinΔC (Fig. 6⇑B). The effect of SinΔC on thymocyte maturation is strikingly similar to the effects observed in p44 MAPK (ERK1)-deficient mice. In these mice, thymocyte maturation beyond the DP CD4+CD8+ stage is reduced by half, with a similar decrease in thymocytes expressing high levels of the TCR (CD3high) (60). These same phenotypic features are present in the SinΔC transgenic thymocytes. It is thus possible that reduced ERK activation and, as a consequence, alteration of signaling thresholds is responsible for the effects of SinΔC on thymocyte maturation in our system. SinΔC-mediated changes in TCR-dependent signaling thresholds could in turn affect the positive and/or negative selection of SinΔC-expressing DP thymocytes. Efforts are currently under way to elucidate the molecular mechanisms of SinΔC-mediated inhibition of ERK phosphorylation and its effects on positive and negative selection. To this end, SinΔC mice that have been sufficiently backcrossed to the C57/B6 background will be crossed to TCR transgenic mice, such as the H-Y TCR transgenic animals, to address the role of SinΔC expression on positive and/or negative selection. Finally, because in our experiments we are using an activated form of Sin, SinΔC, we believe that the effects of the truncated mutant on thymocyte maturation and apoptosis reflect the function of endogenous Sin and that endogenous Sin is a negative regulator of T lymphocyte function. This is supported by experiments in Jurkat cells showing that both full-length Sin and SinΔC inhibit activation of NFAT and AP-1 reporter constructs in response to TCR stimulation and act as negative regulators of T cell activation (our unpublished observations). Experiments to further explore these observations are currently under way in the form of generating transgenic mice expressing full-length Sin and Sin knockout animals. We anticipate that these experiments will support a role for Sin as a negative regulator of T lymphocyte function and will provide novel insight into TCR-mediated signaling pathways. We thank Jerry Siu and Yong-Rui Zou for critically reading the manuscript and Michael Weston for his input and helpful discussions. ↵1 This work was supported in part by American Cancer Society Grant RPG99-09-01 MGO, Department of Defense Grants DAMD17-99-1-9151 and DAMD17-99-1-915, National Institute of Allergy and Infectious Diseases Grant RO1 AI49387-01, American Cancer Society Institutional Research Grant No. 177F, and the Herbert Irving Comprehensive Cancer Center. L.T.D. was supported by National Institutes of Health Grant 5 T32 AI07525. A.G.R. was supported by National Institutes of Health Grant 5 T32 GM03767-26. K.A. was supported in part by Department of Defense Grants DAMD17-99-1-9151 and DAMD17-99-1-915, National Institute of Allergy and Infectious Diseases Grant RO1 AI49387-01, and American Cancer Society Grant RPG99-09-01 MGO. ↵3 Abbreviations used in this paper: SLP76, Src homology 2 domain-containing leukocyte protein of 76 kDa; Cbl, Casitas B cell lymphoma; ERK, extracellular signal-regulated kinase; SH, Src homology; SP, single positive; JNK, jun N-terminal kinase; 7AAD, 7-amino actinomycin D; MAPK, mitogen-activated protein kinase; DN, double negative; DP, double positive.